Multi-Factor Authentication, or MFA for short, is a method of granting account access using more than one authentication method. For instance, instead of merely keying a password to log into an account, MFA might require a verification code sent through SMS or a third-party app to be entered as well. Based on your company's security policies, MFA can be activated for your users so that each time they log in they are required to enter their MFA token in addition to their password. Contact your CSM with a request to allow MFA for your user login. 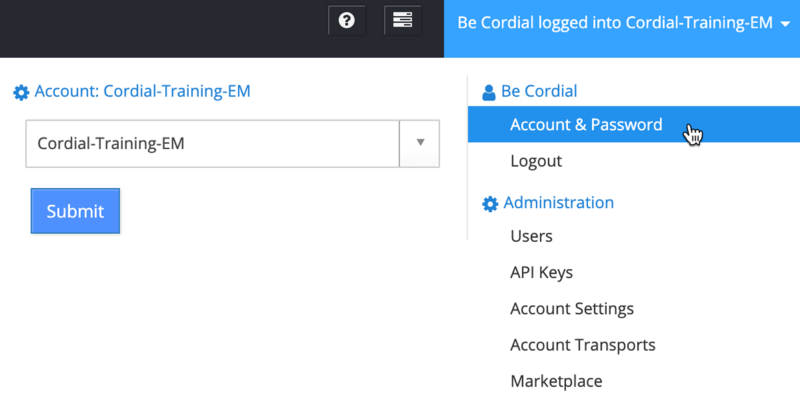 Log into your Cordial account and navigate to Account & Password using the top right navigation menu. Under Multi-Factor Authentication, click the green Enable button. Now open your MFA app. If you do not already have one, download the Google Authenticator App from the Google Play Store or the Apple App Store. Within Google Authenticator, scan the QR code or enter the written code provided in your Cordial account. Moving forward, whenever you log into your Cordial account, key in your password as well as the code provided in your MFA app. To reset MFA for a user, please submit a ticket. Be sure to specify which username (i.e., email address) needs its MFA reset.